Players dribble out to the manaquin and beat them with a &apos;Inside-outside&apos;. Upon eye contact with the waiting player at the far end the next player goes. The process repeats. One player on center line is the defender. Player cannot move off the line. Attacker looks to beat defender without the ball leaving the area. If defender wins ball or forces the attacker out of bounds then the two switch places. Play for 2 mins, keep score and play a promotion relegation tournament. Field divided into thirds with ~2 players from each side in each third. Ball is played in by coach. Ball is played into the middle by coach. 2v2 in the middle. Middle players are trying to play into one of the two players in their attacking third. 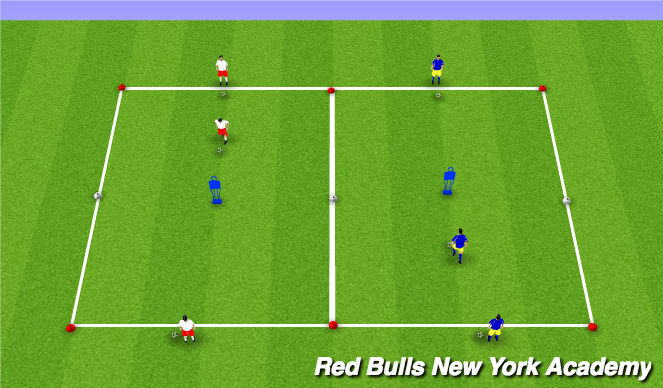 Once ball is played into one of their players, the receiving player is 1v1 to goal against the closest defender. *The other two players in that third of the field are frozen and cannot play. Until a shot, ball goes out, etc. when play restarts in the middle. 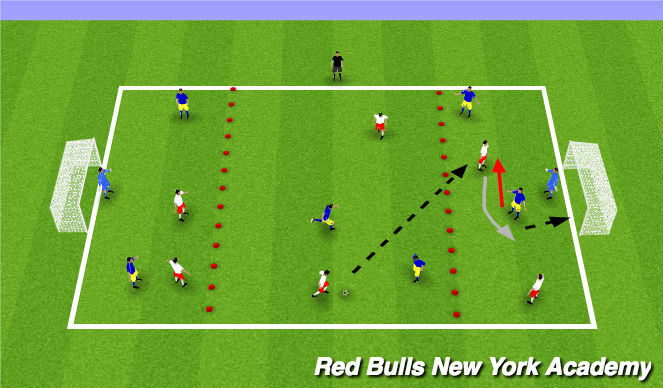 *2v2 in the middle can play back to players on their team in the defensive third in order to keep possession (e.g. if blue plays back to blue in their defensive third, white cannot steal the ball) but they only have 2 touches. Possession goes to the other team if defenders take more than 2 touches or if the ball stops moving at any point. - Using moves to unbalance defender and score.